In terms of status, the Library is currently listed under “local interest libraries”, “libraries other than public and local authority facilities, open to the public” – this according to Latium Region Law 42 of 24th November 1997, Art. 17, Regulation of cultural goods and services in Latium, establishing the bases of organisation and integrated library services, further integrated by Regional Law 14 of 6th August 1999. 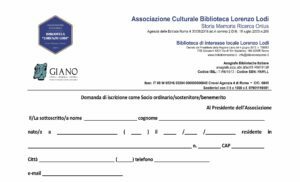 Since 18th May 2017, the Library has been included in the Italian Library Register and is a member of the Roma Capitale SBN pole. Library services are available to Italian and foreign nationals aged 16 and above. Either membership or Supporter/Friend of Library status is required. For upper secondary and university students, the membership fee is € 10 per year. Valid student ID is required. Undergraduate interns working at the Library may borrow free of charge. On payment of the annual quota of € 20, a one-year membership card will be issued, running from 1 January to 31 December. The Library uses a members’ entry register. Membership is for one year and valid ID is required. All users must return any materials received to the staff on duty before exiting the Library premises. Staff will check the state of the materials being returned in front of the user. All bags or cases must be stored in the receptacle provided. Smoking, the use of cell phones, activities other than reading and consultation of materials, and making a disturbance are not allowed in the reading room. Users are asked to take great care consulting both printed and microfilmed materials. Marking or writing on issued materials is strictly forbidden, as is causing damage to furniture and fittings. Issued materials may not be removed from the reading room. The Library reserves the right to take legal action over civil or penal offences and any user breaking these regulations will be barred from the reading room and will be liable for reimbursement for eventual replacement costs or repairs in the amount determined by the Library management. The Library is open Monday – Friday from 15.30 – 19.00. Given that the Library is staffed by volunteers, it is advisable to phone beforehand (06 98357179) or mail info@bibliolorenzolodi.it. Our collections are displayed using the drop-down menu at the top left of the page. With the exception of materials indicated in the catalogue or directly bearing a loan exclusion marker, all documents may be borrowed. Materials that may be loaned include books, VHS cassettes, audio CDs, CD-ROMs and DVDs, in accordance with the terms of Law no. 248/00. The loan period is 30 days and a maximum of three items may be borrowed at any one time. Vinyl 33 and 45 rpm discs and music cassettes can be converted into MP3 format on request. VHS and VHS c cassettes can be converted into formats of choice (MPEG, MPEG4, Quicktime etc.). Slides and negatives can be scanned with both flatbed and planetary scanners. We have obtained authorisation for the reproduction and consultation of books, newspapers and other documents, to be viewed both on-line and on one’s own pc, whether Windows or Apple. Please contact us for further details.